LAW OF THE NORTH (1932, Monogram) Bill Cody, Andy Shuford, Nadine Dore. Bill is arrested for murder! A corrupt judge is behind it all and decides to try Bill immediately. Bill’s pals help him escape from the courtroom, though, after which he sets out to gain revenge on the real killer. A posse is close behind. Watch out Bill! All in all, Cody’s Monograms were a pretty good lot. Quite rare, too. From 16mm. VANISHING RIDERS (1935) Bill Cody, Wally Wales, Roger Williams Ethel Jackson. It’s not often you see a western hero parading around in a skeleton costume to scare off the bad guys; and it’s even rarer when he dresses up his horse in the same kind of goofy costume! Needless to say, this movie’s a real howl. 16mm. WESTERN RACKETEERS (1935, Aywon) Bill Cody, Edna Aselin, George Chesebro, Wally Wales. Though Cody’s films are cheap and often uneven, there are some that rise far above their low budget limitations. Frontier Days and Reckless Buckaroo are fine examples. Western Racketeers falls a little above mid-grade between Bill’s best and worst. Bill leads a vigilante group against outlaws who are terrorizing ranchers by charging a toll on cattle that pass through a lonely pass on their way to market. Ranchers who don’t pay are slain! Bill’s group fights back. 16mm. 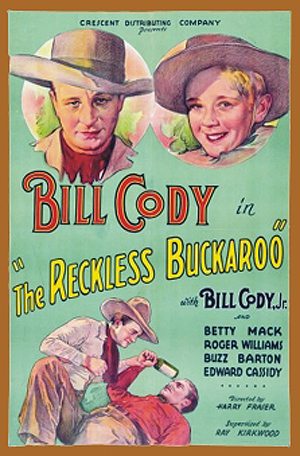 RECKLESS BUCKAROO (1936, Spectrum) Bill Cody, Betty Mack, Bill Cody, Jr., Roger Williams, Ed Cassidy. This and Frontier Days may well be Cody’s best films. Bill saves a sheriff, left to die in the blazing sun by desert bandits. Together they ride out after the crooks. One scene has Bill decking a thug with a wicked uppercut. Spectacular cinematography with great desert locales. Most enjoyable. 16mm.